Use this cupcake wrapper template to create your own adorable cupcake wrappers for your events. 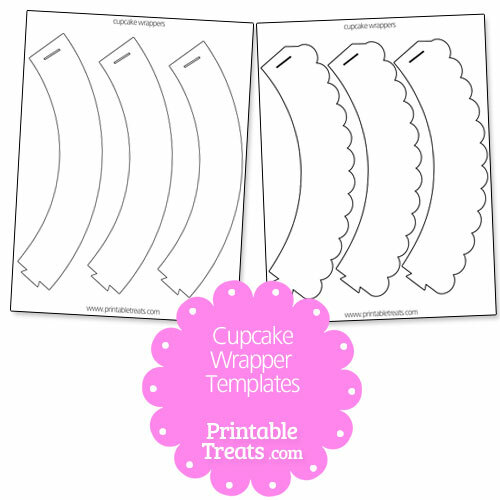 In this printable you’ll get 2 cupcake wrapper pages with three wrapper outlines on each. One of them contains straight edge cupcake wrappers and the other has a scalloped edge for fancier cupcake wrappers. You can either print these out on patterned paper (scrapbook paper works nicely) or print them out on white paper and decorate them. If you have some sort of textured glittered paper that makes it difficult to print on, you can use these cupcake wrapper templates as a stencil to trace the shape onto your nice paper. If you would like to share the cupcake wrapper outlines with a friend, please send them directly to this page (Do not link directly to the download file.) so that they can download a copy for themselves.